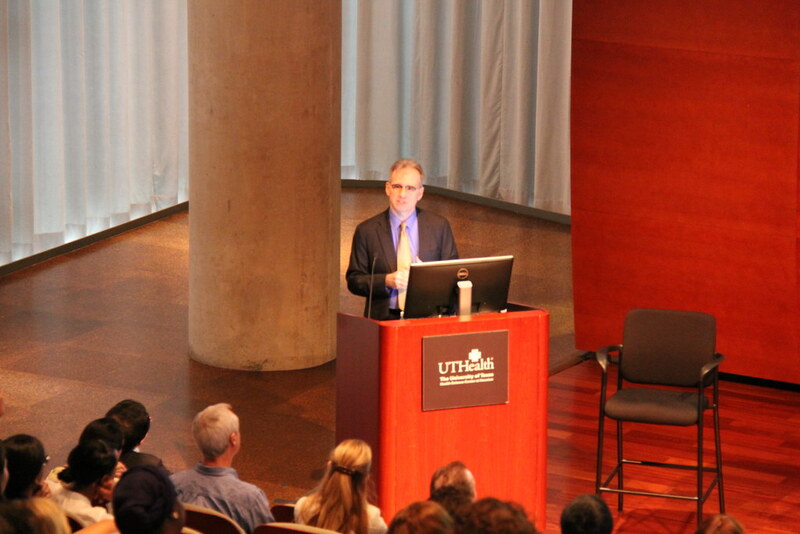 Photo of Dr. Eric Schneider at SBMI's First Annual Health Technology and Policy Speaker Series in 2017. The seminar is open to the public and will take place in SBMI’s new building expansion (7000 Fannin St., UCT E-612 & E-614) from 8:30 to 10 a.m. Refreshments will be served and we hope all from the SBMI Community can attend. We hope everyone had a safe holiday season. We want to welcome back all returning SBMI students. To all new SBMI students, we are very happy to have you join the SBMI community here at UTHealth. We are looking forward to a successful spring semester. Now that the semester has started, we want to remind all students to submit their updated, yearly degree or program plans if it has not been completed recently. Please work with your academic advisor to complete the plan and if you have questions, please contact the Office of Academic Affairs at 713.500.3591 or SBMIAcademics@uth.tmc.edu for assistance. The spring 2019 semester started on Jan. 14, 2019 and class add/drop via myUTH runs from Jan. 14 to Jan. 30. Please refer to the academic calendar for other important spring semester dates. Starting this spring semester, on-campus classes will meet in SBMI’s new building space. Classroom information for courses offered this semester is on the semester schedule page. Faculty who will use the classrooms this semester can contact DE@uth.tmc.edu to schedule a “Classroom Technology Training” session. New and returning students who need their student ID badge activated for access to the new building space should come to the Office of Academic Affairs at UCT E.655. The Distance Education team would like to remind our students that after adding or dropping a course on myUTH, it may take up to 24 hours for that course enrollment change to take effect in their “Courses” list in Canvas. If your Canvas courses do not match your official enrollment 24 hours after the update in myUTH, please contact DE@uth.tmc.edu. All official SBMI communications, including class related emails, will be sent to students’ UTHealth email address. Enrolled students are required to check their UTH email regularly. Enrolled students are also responsible for making sure their computers and network capabilities meet and exceed the technical requirements for SBMI students in order to complete required coursework at SBMI. Louisiana State University (LSU) Shreveport invites SBMI students to its 4th Annual Regional Student Scholars Forum to present research. The forum is scheduled for March 15, 2019 from 9:00 a.m. to 4:00 p.m. on the university’s campus in the LSUS University Center. Both oral and poster presentations are accepted and there are no registration fees to participate. For more information, students should contact the LSU Shreveport Dean of Graduate Studies, Dr. Sanjay Menon, menon@lsus.edu. Abstracts are due Feb. 18, 2019. The Houston HIMSS Chapter is accepting student scholarship applications. For eligibility requirements and application materials, students should visit the chapter’s website. March 1, 2019 is the deadline to apply. SBMI’s new building was covered in the Houston Business Journal late last year. Dean Jiajie Zhang, PhD, was also the focus of a TMC News Q&A about the new high-tech space and the future of the industry. Professor James Langabeer, PhD, MBA, was recently interviewed by KTRH Radio and discussed how the mandate for hospitals to post their list prices online is confusing for patients. KODA (Sunny 99.1 Radio) also aired the interview. Dr. Langabeer is also the PI for the HEROES program. He was recently interviewed about the opioid abuse prevention program and the story was aired by KPRC-TV Channel 2 News.